Today there are over 100 distilleries in Mexico producing over 600 brands of Tequila, and on Friday night over 30 of these brands were available for tasting at the Tequila and More Ultimate Tasting Experience. 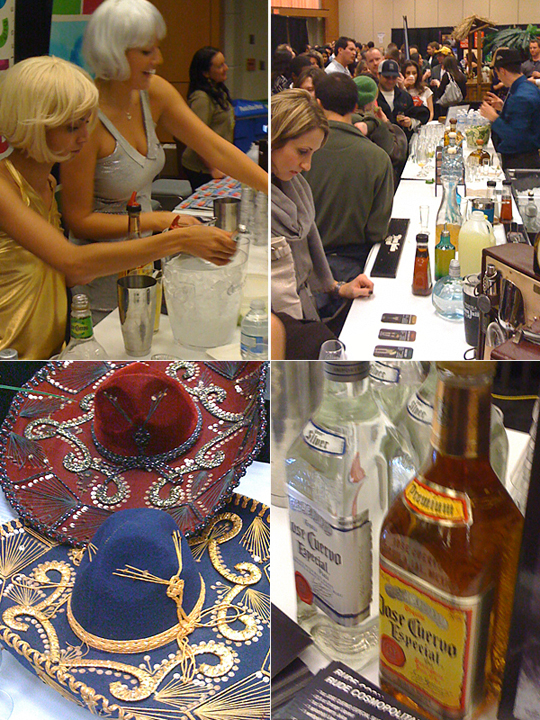 In addition to tequila, the show included tourism booths, Mexican handcrafts and of course the delicious foods of Mexico. The night was a great opportunity for the Madtini Intoxicology crew to learn more about tequila’s history, its production and the different types available. Having so many great brands together in one place allowed us to experience the unique and subtle (sometimes not so subtle) differences between them. We were offered tequila glasses which resembles a small wine glass to sample the different brands. Several brands offered up variations of the ever-popular Margarita cocktail plus a chance to try a tequila cosmopolitan. Besides knowing which end of the bottle to pour from, I know little about tequila. We learned that Tequila originated around the town of Tequila and comes from fermenting and distilling the sap of the agave plant that grows in the area’s red volcanic soils. Some people assume the agave is a some form of cactus due to its ominous appearance, but it’s actually a relative of the lily. But beware, still its sharp spines of the agave are poisonous and very painful to the skin. By law, only the Mexican states of Jalisco, Guanajuato, Michoacán, Nayarit, and Tamaulipas can produce a drink called tequila. The types of tequila are Oro (gold) and blanco (silver), which tend to have a bite to them, due to their young age, while añejo (aged) tequilas have a smoother and more complex taste from resting (or resposado). Most people’s experience with tequila in this area comes from the popular (and delicious) Margarita, or lining up multiple shots. We opted to sip our tequila slowly and enjoy the subtleties of its taste and aromatics. At the end of the evening our clear preference was for the Herradura Resposado, an award-winning tequila with over 16 medals won in international competitions. Herradura first introduced the world to its reposado tequila in 1974, aged for 11 months in toasted white oak barrels provides the tequila with a deep copper colour and smooth taste. It’s aroma and taste provided hints of cinnamon spice, vanilla and is ideal for slow sipping. We’ll be looking for this brand on our next shopping trip. After this night, we’ll feel much more comfortable while considering and purchasing quality tequila for our cocktails.